If you have a design in mind, we can make it for you. Come and talk to us, we will give you a quote for your design - at no cost to you. We are happy to use your own gold if you have jewellery that you no longer wear. Do you have a piece of jewellery that has been handed down to you? If it is worn or missing stones, we can renovate it so it can be worn again. 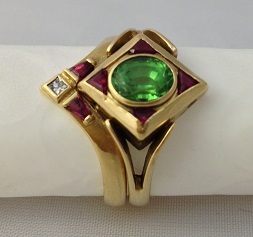 If you have an antique piece of jewellery that is worn or broken beyond repair, we can remake it. We repair and resize rings, bracelets and bangles. Come in and get a free check and quote on your repairs.